A soft and fluffy muffin loaded with fresh, juicy cherries and mini chocolate chips. Cherries are in season right now and I always like to enjoy fruits when they are at their best. I bought a huge bag of these gorgeous, sweet, and juicy cherries on sale from my local grocery store. But, since I couldn’t eat them all, I decided to do some baking with them. I was originally thinking of a double chocolate muffin, but I was concerned that the bold flavor of the cocoa powder would dominate the cherry flavor and I wanted the fresh cherries to be the star of the show. So, I decided to go with a light and delicate sour cream muffin. 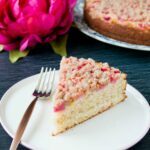 The soft, fluffy texture and rich flavor from the sour cream, mixed with some vanilla extract, complimented the delicious cherries nicely. I do love chocolate and cherries together, so I added some mini chocolate chips which paired the flavors nicely without having the chocolate flavor dominating. You can use regular size chips too, but I prefer the minis since they disperse more evenly throughout the batter and you get some chocolate in every bite. This recipe is so rich and buttery tasting, you won’t believe that it only uses 4 tablespoons of butter and 1/2 cup of sugar. It’s all thanks to the low fat sour cream I use. This means you can love what you’re eating without feeling guilty, and trust me, you’re going to love these muffins. They are my new favorite. I ate 4 the first day, and between my husband and I, all 12 muffins were finished in 3 days. 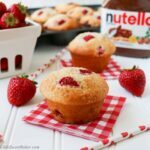 I love how light, moist, and airy these muffins are and my husband loved the combination of cherries and chocolate chips. I had to make another batch as soon as the last one was eaten (don’t judge me until you try these for yourself). This recipe is also super easy to make. There’s no mixer required, just 2 bowls, a whisk and a spatula, so clean up is a breeze. The muffins are baked at an initial high temperature of 425 degrees to create that nice high dome on top. Nothing beats a perfectly golden crispy muffin top, right? Preheat oven to 425°F and spray a 12 cup muffin tray with a non-stick cooking spray. In a large bowl, whisk together the flour, baking powder and salt, set aside. In a medium bowl, whisk together the egg, sugar and honey. Whisk in the melted butter, blend well. Then mix in the sour cream and vanilla. Toss the cherries and chocolate chips in the dry ingredients. Slowly add the wet ingredients to the dry. Gently fold together until JUST combined. Divide the batter into the 12 muffin cups and bake at 425°F for 5 minutes, then turn the oven heat down to 350°F and bake for another 20 minutes or until golden around the edges. Enjoy warm. Muffins are best enjoyed the day of, but can be stored in an airtight container at room temperature for up to 3 days.